You read it here first. That Q&A I did a few posts back with author Patti Callahan Henry. 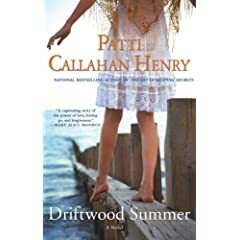 Henry hit the NYTimes bestseller list for the first time ever with her current release, Driftwood Summer. Just wanted you to know for breaking news and hilarious tales of adventures, bookmark this site. Patti, who is a sweet and funny friend, called to share her tears of joy with me. It’s always thrilling to see a friend rewarded for their hard work.